The video comes from the Hardanger Og Voss Museum in Norway, where this team is busy restoring old ships. Using handmade rope is part of keeping things in their original state. Even crazier: Each piece of rope is made for a certain part of the ship, custom-style. They also suggest that people who have boats buy handmade rope for the rigging since it’s better quality. We could watch these guys make rope all day. 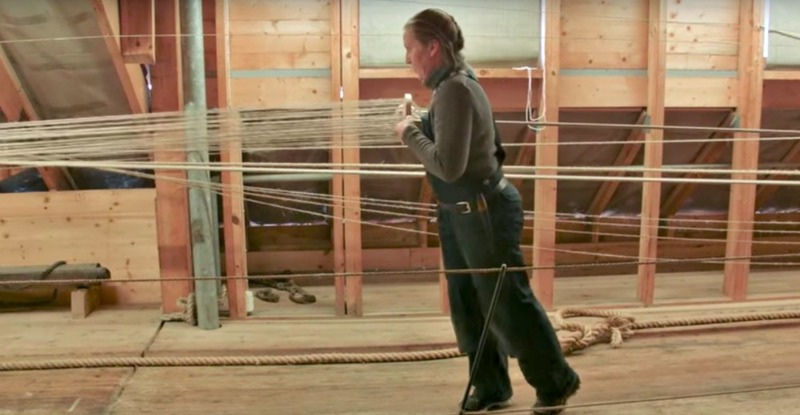 The museum got their own rope maker a few years ago, but it has been 40 whole years since the last person was taught how to make rope in Norway until the museum’s rope maker educated a two other rope makers to keep the tradition alive. This is how the Vikings made rope, people. Life was obviously a heck of a lot harder back in the day. Next time you’re on a boat and see a huge roll of rope, take note — some person might have wound that up with their own two hands.